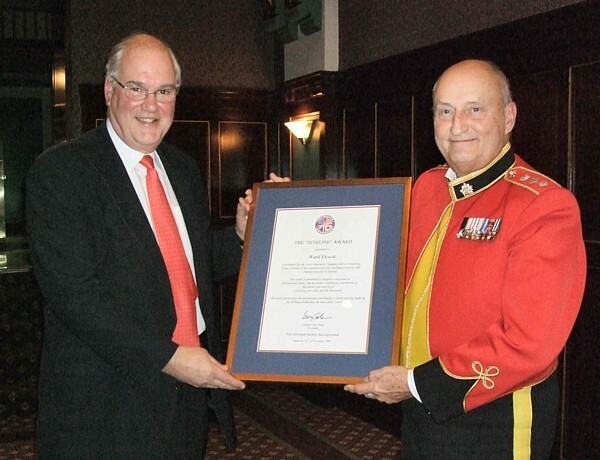 In 2008 the Intrepid Society established the Intrepid Award to recognize a national or international leader who has made a significant contribution to the defence and security of CANADA, our allies and the free world. The award perpetuates the exceptional contribution to world security made by Sir William Stephenson, the man called “Intrepid”. The 2009 Intrepid Award was presented to Ward Elcock, coordinator for the 2010 Vancouver Olympics and G-8 Security, former Director of the Canadian Security Intelligence Service and Deputy Minister of Defence. Ward Elcock [left] receiving the 2009 Intrepid Award from Gary Solar at the Intrepid Award Dinner at the Fort Garry Hotel in Winnipeg. Canadian Ambassador to Iran, Kenneth D Taylor, rescued the six Americans who for several months had found refuge with Canadian diplomats in Tehran then were whisked away in a successful undercover mission from the revolution that had engulfed Iran. Ambassador Kenneth D Taylor was awarded the Congressional Gold Medal on March 6, 1980. The former Canadian Ambassador to Iran, Kenneth Taylor wasthe guest speaker at the Intrepid Awards dinner in Winnipeg, and received the “Intrepid Award”. The men and women in the Canadian Security Intelligence Service, the Royal Canadian Mounted Police, the Military Intelligence Branch, our Border and Airport security, Canada’s diplomats and Foreign Service, in their mission of national security are considered and acknowledged for their contribution, courage and personal sacrifices made by all members of these services. Many, because of the secret and confidential aspect of their profession, most often cannot be identified or recognized for their intrepid service. We present the “Intrepid” award to the Honourable Kenneth Taylor, as former Ambassador to Iran and ask that he receive it on behalf of all Canadians who guard our borders, provide security, defend our nation and our allies.